Requested by Ariall who knows how much pain I am in whenever there's a mention of Hide. There's that color meme over at tumblr and let's just say I had loads of fun. 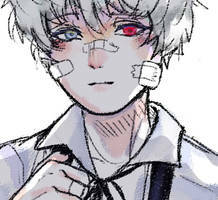 Tokyo Ghoul's million dollar question: What happened to this precious sunshine boy?